Tingling sensations in the hands and feet are felt by many people. Fortunately, there are some movements that you can do to reduce these tingling sensations. 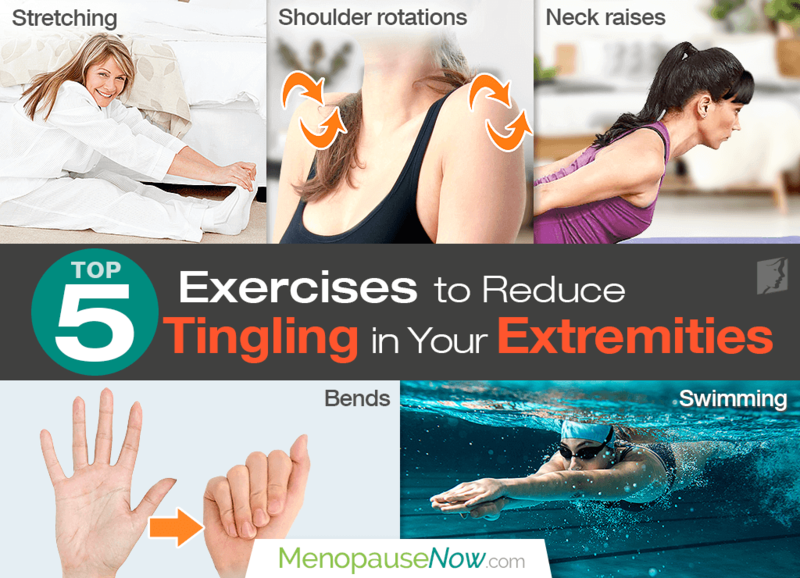 Continue reading for five exercises that may reduce tingling in your extremities. Stretching can be an effective treatment for combating tingling extremities. Begin by gently stretching the muscles in your hands, arms, feet, and legs to improve the blood circulation in your fingers and toes, which may help relieve the tingling in them. Failing to maintain good shoulder posture can lead to the compression of nerves, which can cause tingling and worsen the numbness in the hands and fingers. To prevent and relieve this, you can exercise your shoulders by rotating them. Do this by keeping your arms at your side and bending your elbow at a 90-degree angle. Keep your arm in the same position by your side and extend your elbow out, and then return it. You can also shrug your shoulders in a circular motion. Doing 10 repetitions of this may help to reduce tingling in your extremities. Maintaining a seated position for a long period of time, such as sitting at a desk during the workday, can cause your head to gradually move forward, which can affect the nerves in the neck that connect to your fingers. The easiest way to combat this is by doing neck raises. Lie face down and raise your head up until you are facing straight ahead, and then return to face down position. Doing repetitions of this may help reduce the strain placed on your neck's nerves and strengthen the surrounding muscles. Finger and toe bends are exercises that may be done throughout the day. They are most effective at relieving tingling caused by lack of blood flow or sore muscles. Simply hold your fingers or toes out straight, and then slowly bend them inwards, repeating several times. Swimming is a great exercise to take up because it is a low-impact exercise that encourages blood flow to your extremities, lessening tingling without the risk of exacerbating the problem. Swimming is excellent for all-round health as well. Some exercises can relieve the symptom of tingling extremities. However, tingling extremities can be caused by several serious conditions, including carpal tunnel syndrome, stroke, diabetes, or an underactive thyroid, so it is important to see a doctor if the tingling sensation persists or does not have a known, treatable cause. It is also recommended that you see a physical therapist to help instruct you with the exercises and stretches that are right for you. This is especially important if you are suffering from a pinched nerve or another condition that could be agitated or worsened by certain stretches or exercises, especially if they are done incorrectly.